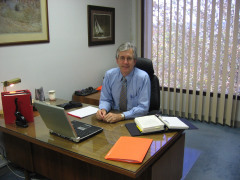 Mark Esau, Adelaide, South Australia - Barrister, Solicitor and Notary Public. The Supreme Court is the highest Court in South Australia. It deals with the most serious criminal trials and also the most substantial civil claims. It also deals with appeals from the Magistrates Court and the District Court. When conducting a trial there is a single Judge of the Supreme Court. When conducting an appeal there are normally three Judges. of crime claims as well as substantial commercial disputes. It also deals with appeals from the minor civil claims of the Magistrates Court. The Magistrates Court deals with summary criminal offences and civil claims. The Family Court and the Federal Circuit Court deal with matters arising under the Family Law Act 1975. The Federal Circuit Court also deals with other matters arising under federal legislation including the Australian Consumer Law. Normally proceedings concerning children or the settlement of matrimonial property are issued and dealt with in the Federal Circuit Court. The Federal Court of Australia is above the Federal Circuit Court and also deals with matters arising under federal legislation. The WorkCover system in South Australia is governed by the Return to Work Act 2014. That Act makes provision for the payment of income maintenance, medical and rehabilitation expenses and lump sum disability assessment payments for injured workers. Retail and commercial leases in South Australia are governed by the provisions of the Retail and Commercial Leases Act 1985. That Act contains a number of mandatory provisions which bind lessors and lessees. Some of those provisions can be excluded in certain circumstances. In effect the Act sets out certain minimum requirements that must be contained in commercial leases in order to ensure there is fairness and balance between the lessor and the lessee. In addition the Act requires that a document known as a Disclosure Statement be provided to each lessee prior to entering into the lease. The effect of the Disclosure Statement is to inform the lessee concerning various key matters arising under the lease. Companies in Australia are governed by the Corporations Act 2001. This Act contains provisions concerning how companies are formed, managed and, in some circumstances, wound up. There are detailed provisions concerning the duties and obligations of directors of companies to their shareholders and also to the general public. If a company is insolvent then it may be subject to external administration either by an administrator or by a liquidator. It is always important to properly record and document what is agreed in commercial transactions. Legal advice at an early stage can often prevent disputes from arising at a later time concerning what was intended by the parties to the agreement. Also sometimes parties to an agreement can each have a different opinion about what was meant to be agreed and these differences may be highlighted and dealt with at an early stage during the process of completing the preparation of a commercial agreement. Wills in South Australia are governed by the Wills Act 1936. It is always desirable to have a current will. If a person dies leaving no will then there is what is known as an intestacy. This means that the person's estate will be distributed according to the provisions of the Administration and Probate Act 1919. A distribution under this Act may not be in accordance with the deceased's wishes. Sometimes circumstances change. When that occurs the contents of a will should be reviewed to make sure that it provides for the estate in the correct manner. Often when a person makes a will a document called an enduring power of attorney is also made under the Powers of Attorney and Agency Act 1984. This Act provides for a person to appoint another person as an attorney to look after the person's affairs, in particular if the person subsequently suffers from mental incapacity. It is also possible to appoint a person an enduring guardian under the Guardianship and Administration Act 1993. An enduring power of attorney is normally concerned with a person's financial affairs. The appointment of an enduring guardian is designed in particular to assist people with dementia who cannot attend to their own daily affairs. It is also possible to appoint a person under a medical power of attorney pursuant to the Consent to Medical Treatment and Palliative Care Act 1995. Under that Act a medical power of attorney can make decisions concerning medical treatment when those decisions cannot be made by a person. Buying and selling a business may be governed by the provisions of the Land and Business (Sale and Conveyancing) Act 1994. This act contains provisions concerning what particulars may have to be supplied to a purchaser before settlement. Money can be recovered for the injuries (pain and suffering) and also for loss of income (past and future) and medical expenses. Civil liability claims in South Australia are governed by the provisions of the Civil Liability Act 1936. Victims of crime claims are governed by the Victims of Crime Act 2001. This Act sets up a scheme for compensation that is administered by the Crown Solicitor's Office. Persons who are convicted of criminal offences in South Australia are required to pay a levy. This levy is used for the purpose of compensating victims. Victims can receive compensation for injuries, loss of income and medical expenses. A person wishing to claim victims of crime compensation must cooperate fully with the police concerning any criminal inquiries and should also report the criminal offence to the police at the earliest opportunity. In addition a person who sustains injury as a result of a crime may also have a claim for common law damages. This type of claim is directed to the offender personally and not to the victims of crime scheme. A common law claim is only appropriate where the offender has assets that can be used to pay any judgment issued by the Court. This page is not intended to be legal advice but is a brief discussion concerning various legal matters. If you require more detailed advice please ring me and we can discuss how I can be of service to you.